This exquisite 4,000 sq. 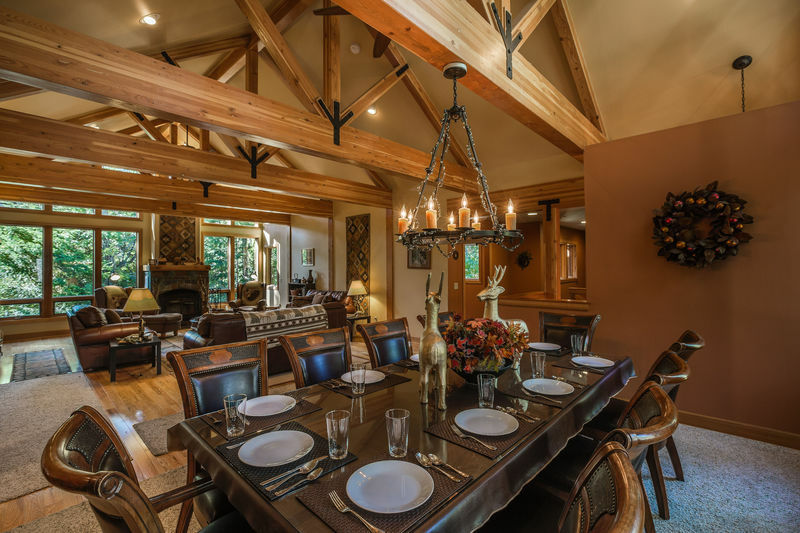 ft custom cedar home nestled among towering, stately evergreens is beautifully decorated in warm earth tones, wood, slate, and leather, perfect for family reunions, corporate meetings, or memorable vacations. 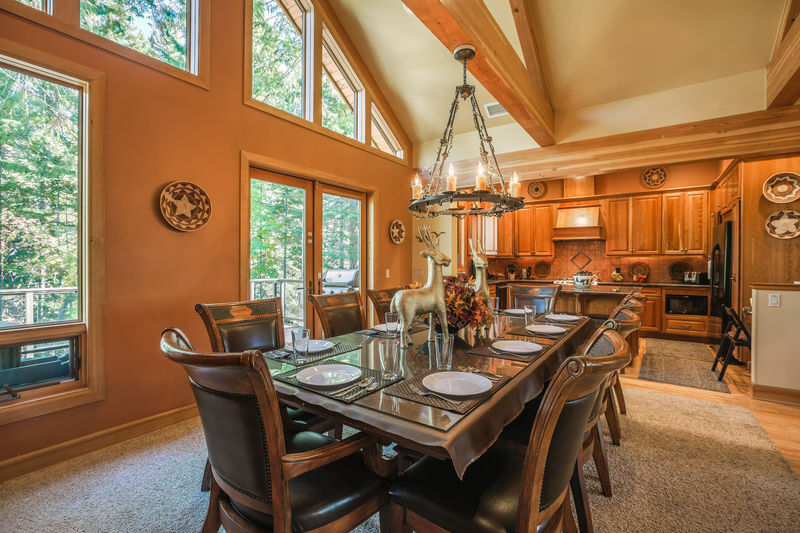 Accommodating up to 14, Majestic Pines Lodge is perfect for your special event, whether it's a family reunion, a holiday getaway, a corporate meeting place for your business, or the perfect recreational vacation. 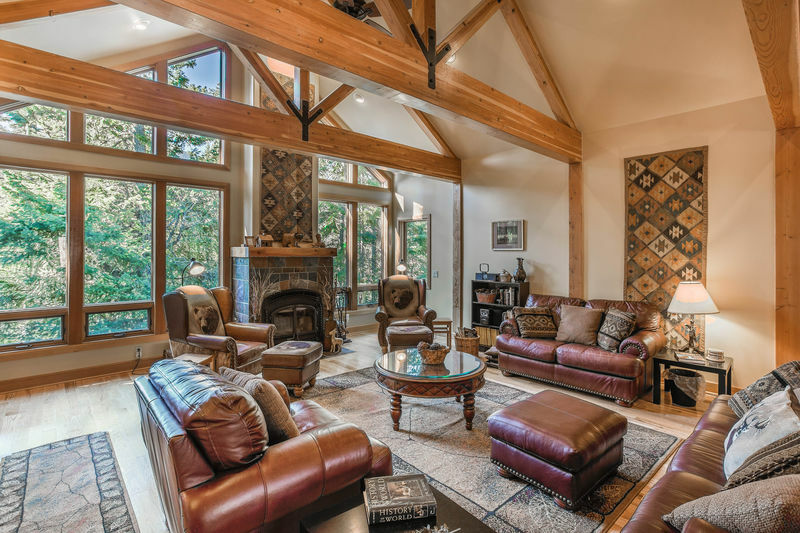 Beautifully decorated with the warmth and elegance of earth tones, wood, and slate, the great room of Majestic Pines features cathedral ceilings, large wood beams, wide windows that highlight the amazing view of the Cascade Mountains, and the stunning slate-tiled fireplace. 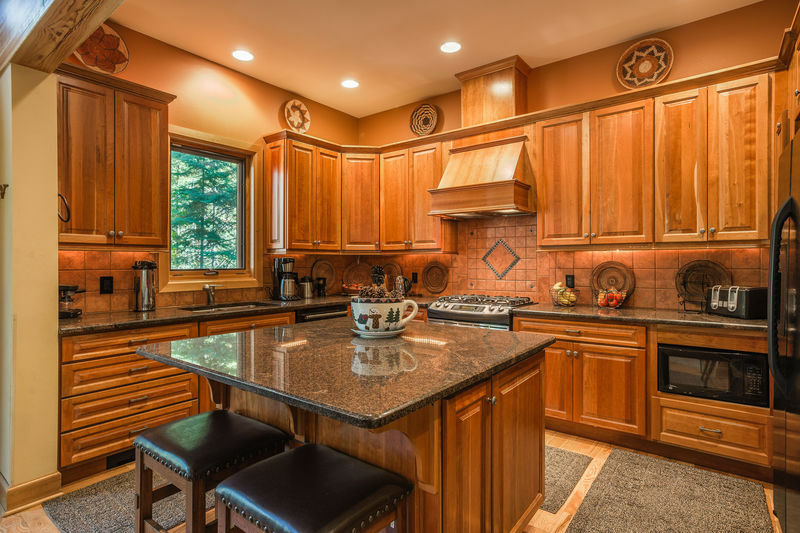 The gourmet kitchen is the cook's dream come true, with spacious granite countertops, cherry wood cabinets, leather bar stools, and with large and small appliances, including a Keurig coffee maker. The dining area has beautiful table and ten leather backed chairs. 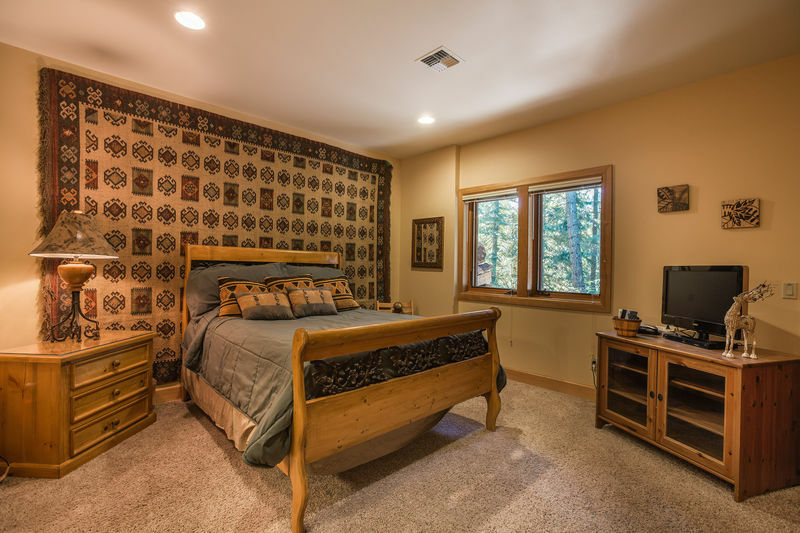 Bedrooms are spacious and beautifully decorated in rustic elegance, with a large and lovely master suite, with huge private bath, on the main floor, and a second master bedroom on the bottom floor. 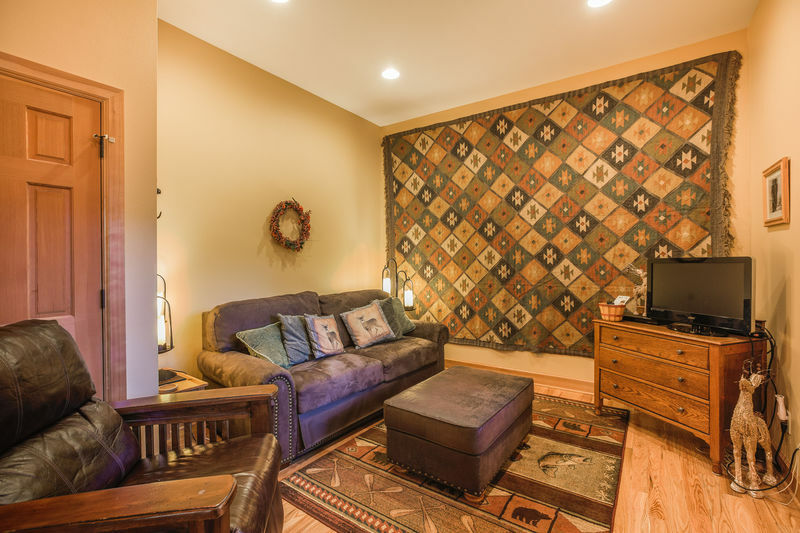 In addition to a great room upstairs, there is a comfortable 20'x45' family room features widescreen cable TV, games, and gas fireplace... perfect for family relaxation! 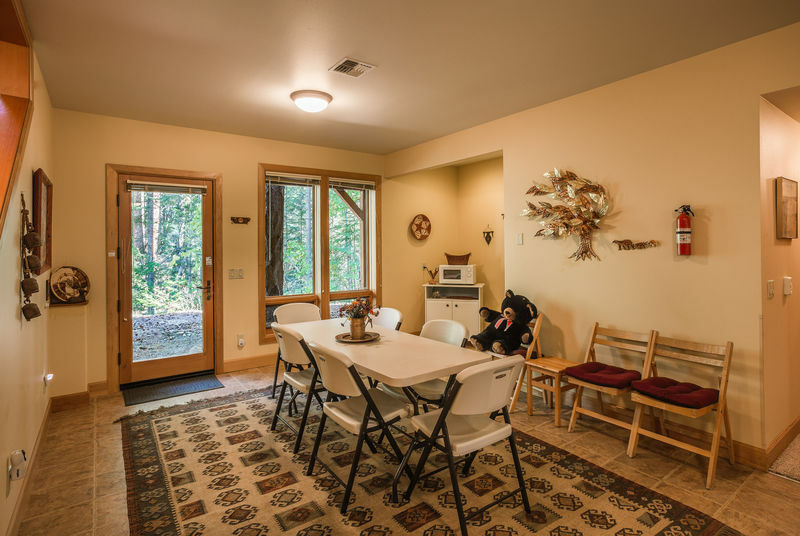 Also this spacious room can be adjusted into a yoga room, and with a secluded, peaceful setting in the woods, enjoy this space to clear the mind and relax the body. There is plenty of roomy deck space and a private hot tub providing outdoor living at its best, in a gorgeous setting! 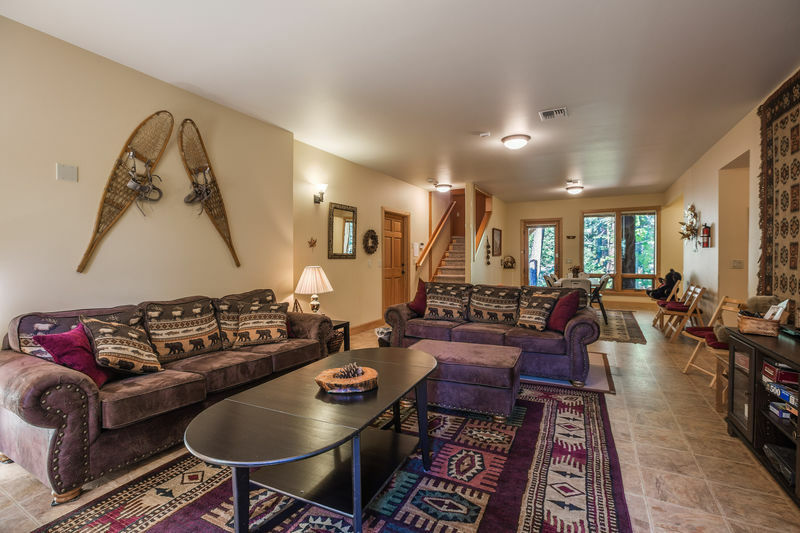 Located only 25 minutes from Steven's Pass, Majestic Pines Lodge is within easy access to the numerous recreational opportunities near Leavenworth, Lake Wenatchee, and Fish Lake. 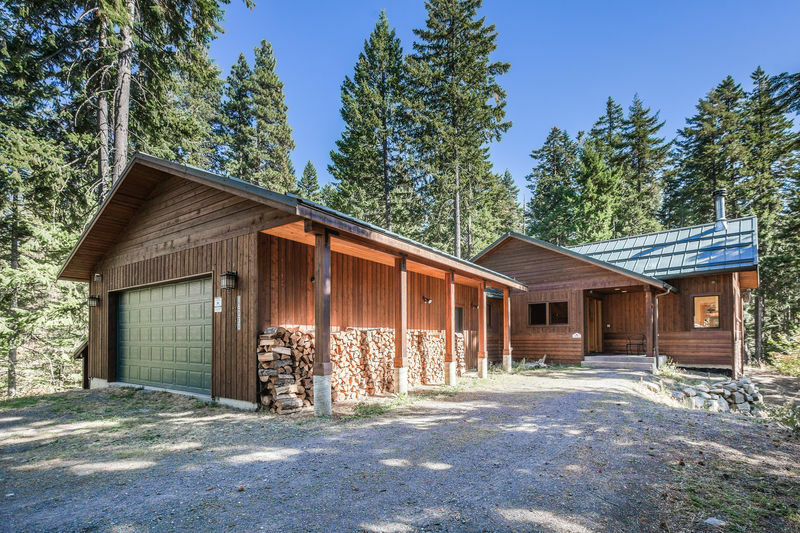 With just a 5 minute walk to beach access on Lake Wenatchee, guests can also enjoy golfing, fishing, boat rental, hiking, and nearby winter skiing. This place is truly special... and it's ready for your special event. Relax into your dreams at the rustic yet elegant Majestic Pines Lodge! Welcome to Majestic Pines Lodge, nestled among the towering pine trees. Approaching Majestic Pines, you will find a stunning, private retreat with guest parking. The Great Room features luxurious leather furniture and and wood-burning fireplace on the main floor. A den with French doors leads off from the great room. Firewood is stacked and ready for keeping you warm in front of a cozy fireplace in the winter. 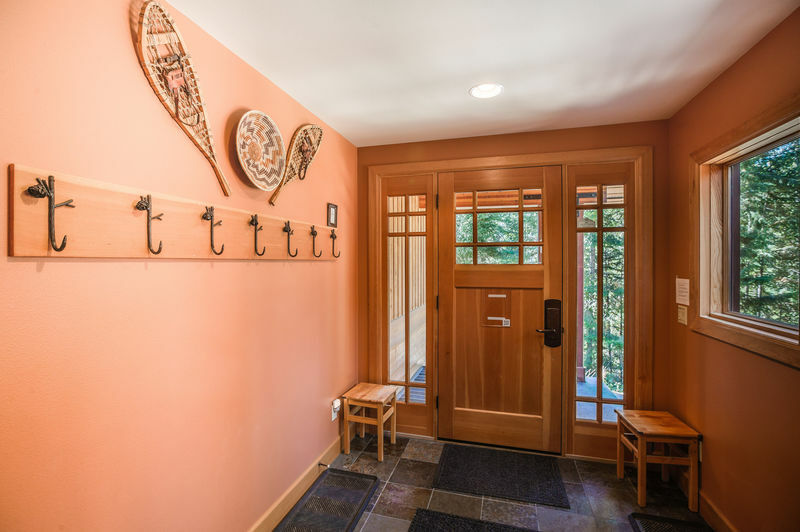 The entrance hallway welcomes you inside with slate floors, a perfect place to take off your shoes and boots after day's worth of hiking, skiing, boating, and more. Delight in the grand dining, which is part of the Great Room, on the main floor. Wonderful seating includes ten high leather-backed chairs on the main floor with additional seating around the kitchen bar, great room, and also at a downstairs casual table. An expansive, beautifully-appointed dining and living experience awaits you in the Great Room. The vaulted ceiling, hardware floors and leather furniture leads you to mingle and relax. There will be plenty of seating around a beautiful dining table for your special meals together. This view of the dining area/Great Room faces a deck. Enjoy a gorgeous gourmet kitchen with granite counters, GE Profile & Kitchen Aide appliances, gas range, and convection oven. The gourmet cook will enjoy a well-stocked kitchen with a wide-range of utensils, staples, spices, and tools that you might need for your culinary creations. 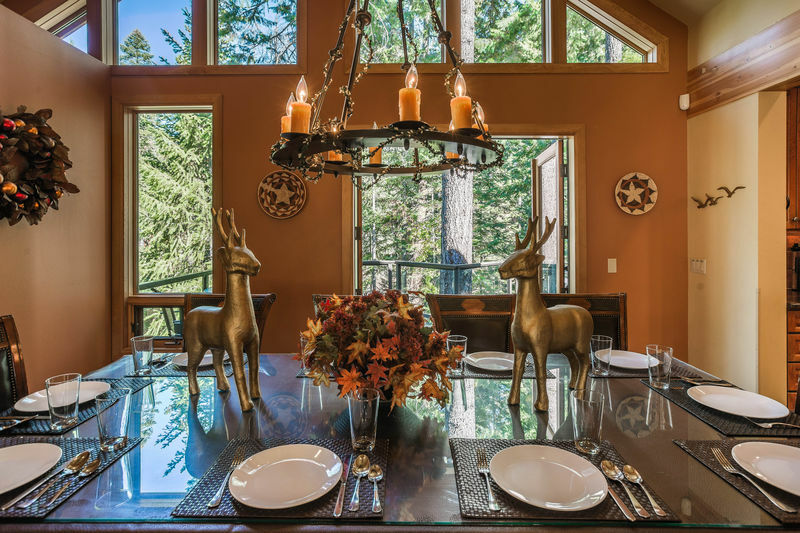 Surround yourself with the beauty of the forest views through the magnificent Great Room windows. 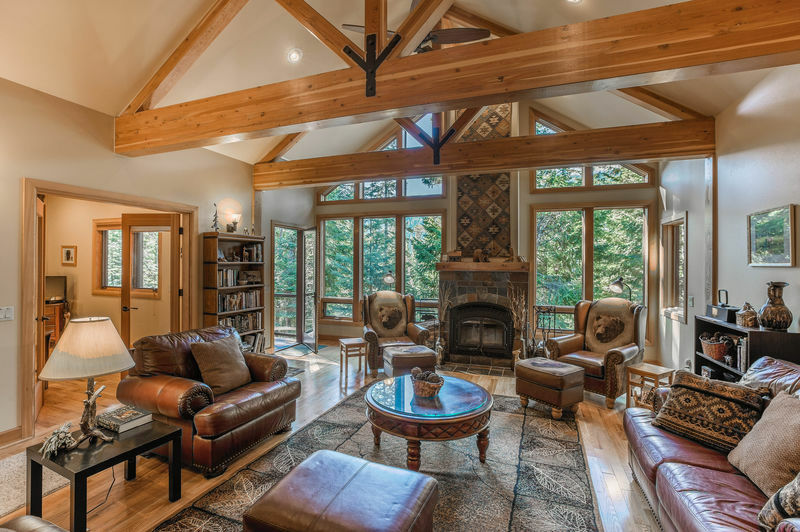 Enjoy lovely natural light with exposed wood beams and trusses. 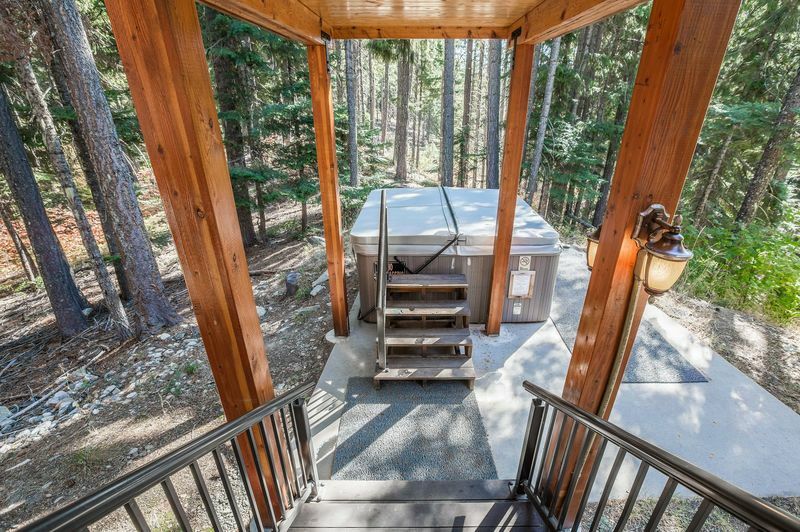 Take a break and follow the stairs under the well-designed covered deck walkway to the hot tub. 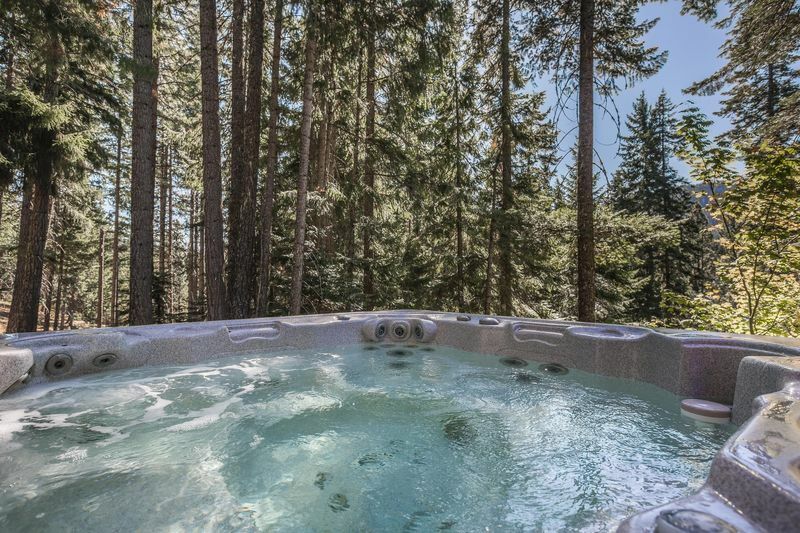 Best of all, the hot tub is open to the stars and views of the surrounding forest land. Luxuriate in the family-sized hot tub. You will feel very peaceful and experience an almost other-worldly place. The master bedroom has beautiful, handcrafted pine furniture, cable TV, walk-in closet, and a very comfortable queen bed. 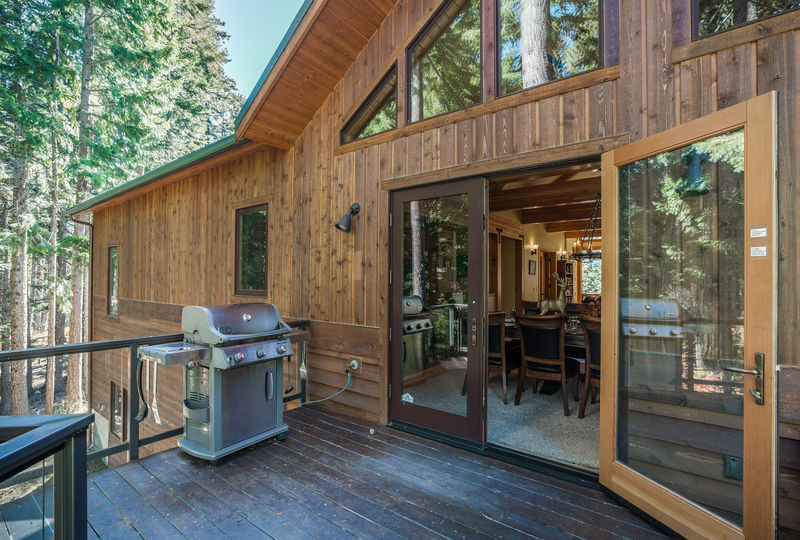 Enjoy a deck outside which leads to the hot tub. 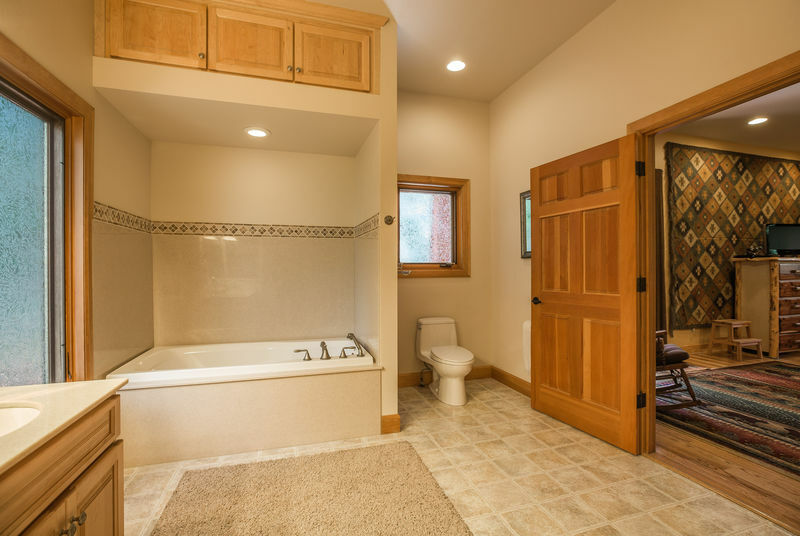 Relax and enjoy a large soaking tub in the spacious master bathroom. 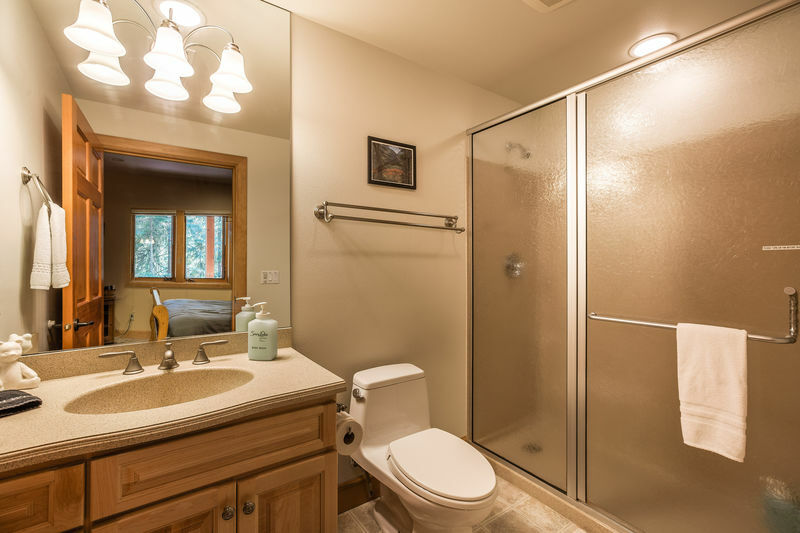 The master bathroom has a a large walk-in custom shower with built-in seating and a double-sink vanity. The den, just off the Great Room on the main floor, provides a wonderful hide-away and can be used as a private bedroom with TV and the "American Leather Comfort Sleeper." 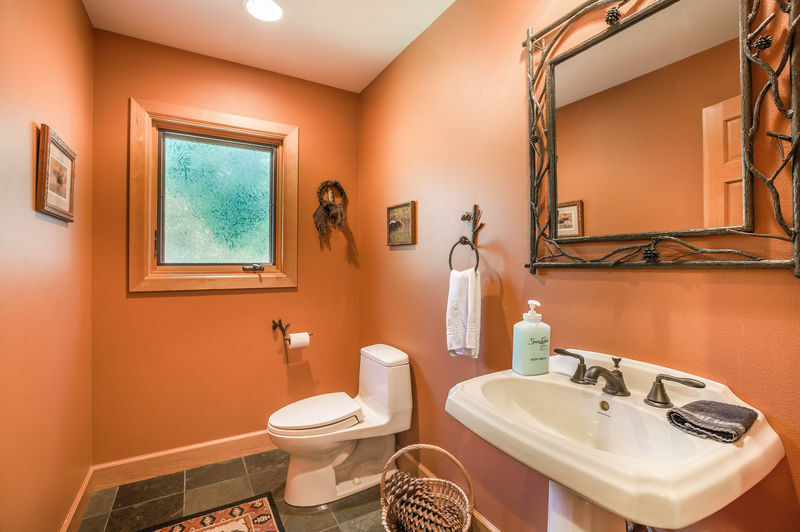 A very accessible half bath with beautiful pine cone trim, is located on the main floor. 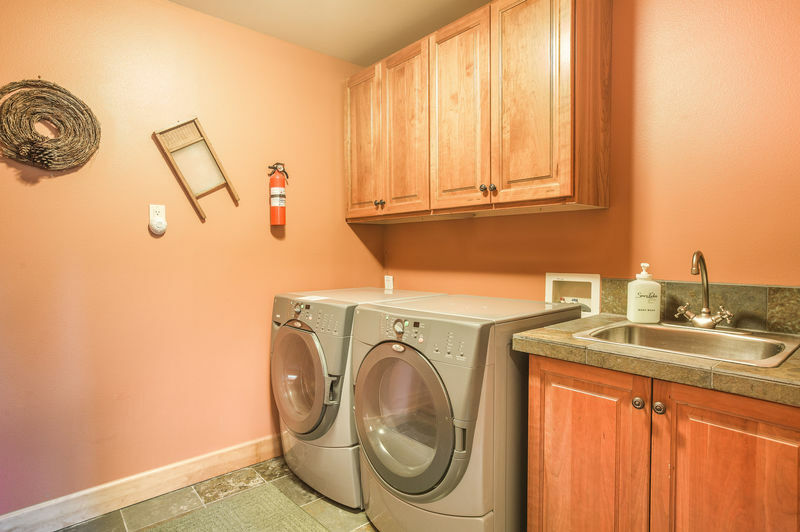 A main floor utility room is ready anytime with Whirlpool washer and dryer on main floor. 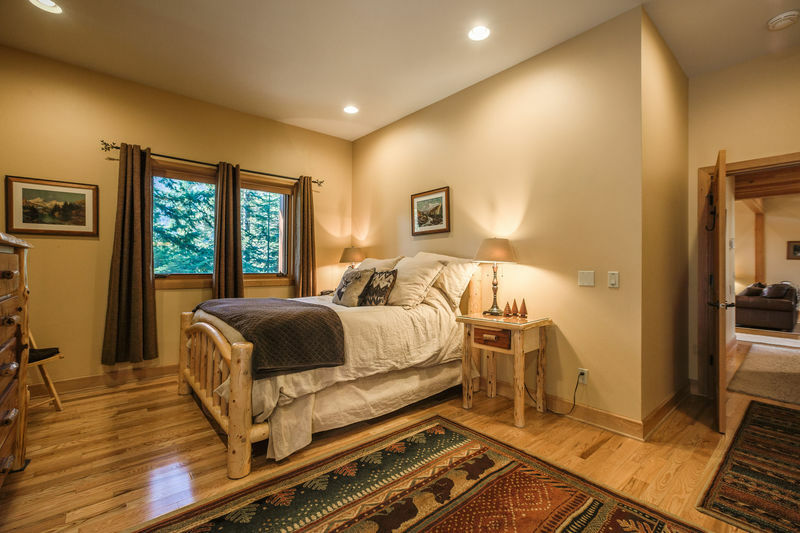 There is a second master bedroom on the lower level with a private bathroom, cable TV, and queen sleigh bed. 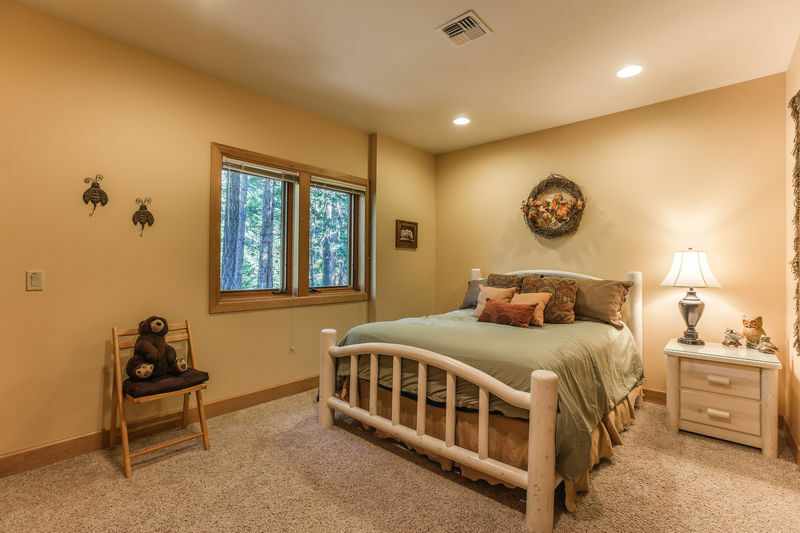 This special queen bedroom has its own sofa for lounging and view into the majestic pines forest on the lower level. 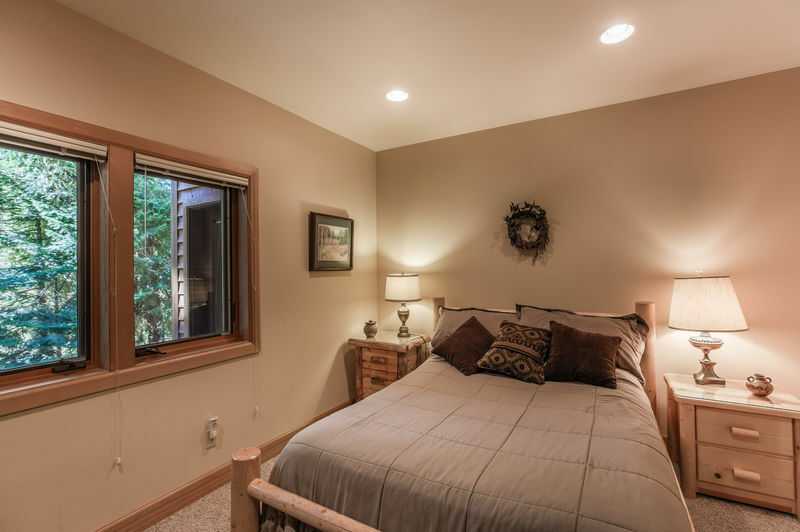 A beautiful corner bedroom with queen bed awaits you on the lower level. 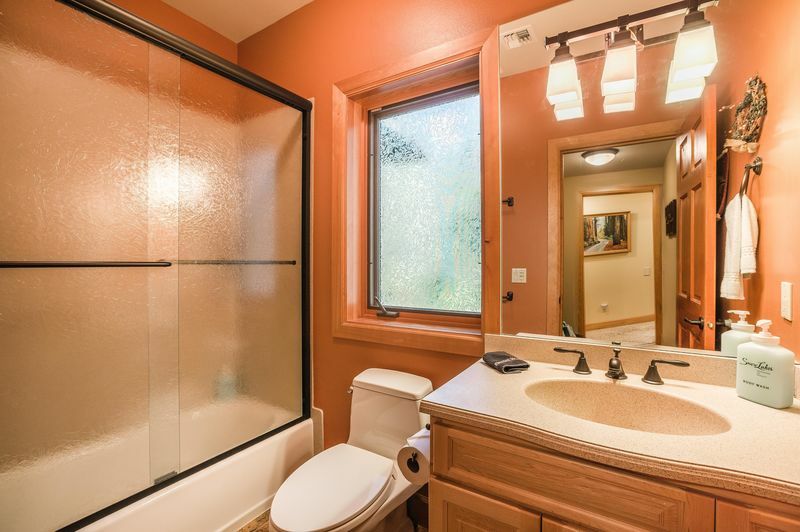 Enjoy a full bathroom with warm colors on lower level. In addition to the upstairs Great Room, there is a very large family room on the lower level. Have fun and stay toasty warm with the gas-burning fireplace. Here is another view of the large family room on the lower level. Live it up in the family room with cable TV and more. This is another view of part of the lower level family room. This area can be an informal, casual dining and/or a game room or craft area. The main floor dining area leads out through French Doors to deck with gas BBQ. You can cook up a feast! 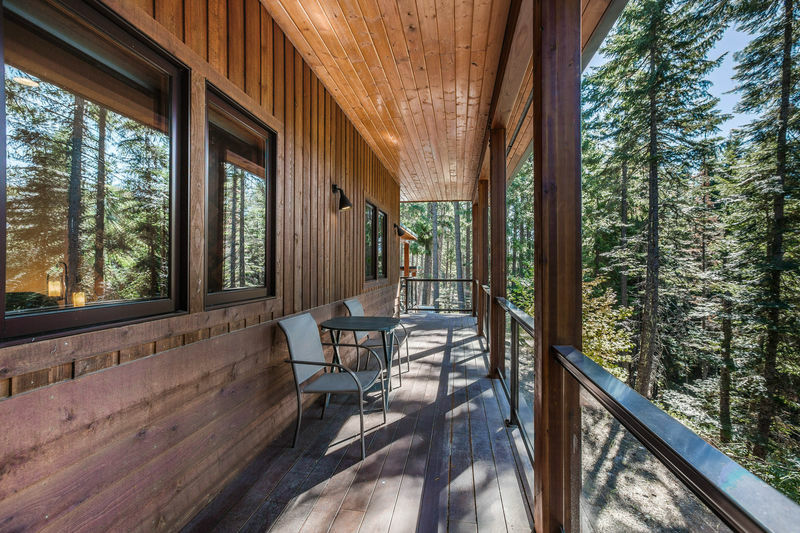 Relax on a beautiful, hardwood deck just outside the Great Room on the main level. This deck wraps around to the master bedroom deck and hot tub. 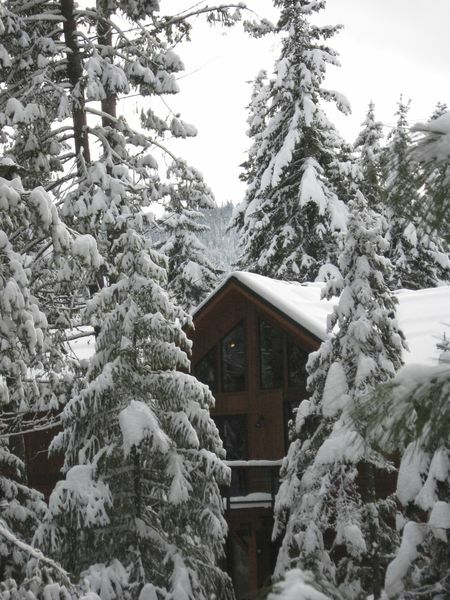 Beautiful Lake Wenatchee is only a short walk away from Majestic Pines Lodge. There is a trail from the house and access to the lake with this view. 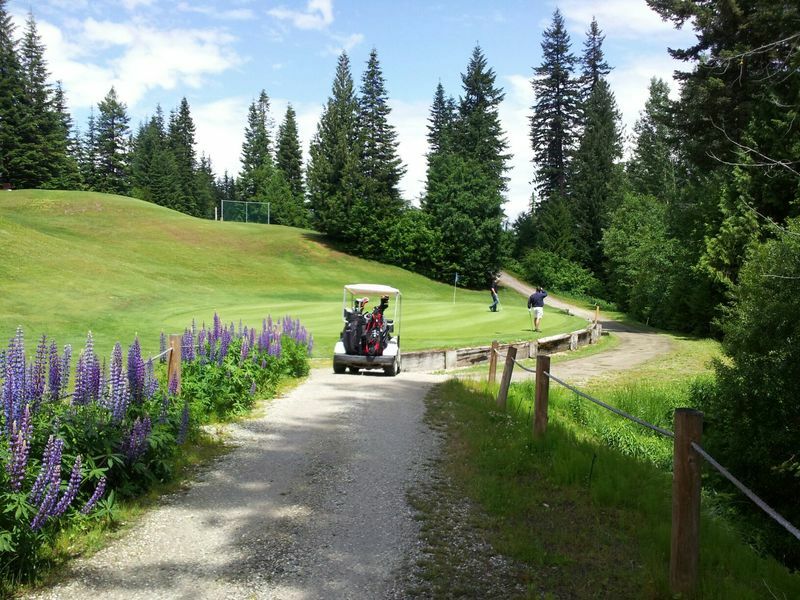 The Khaler Glen Golf course is a just 5-minute drive away. 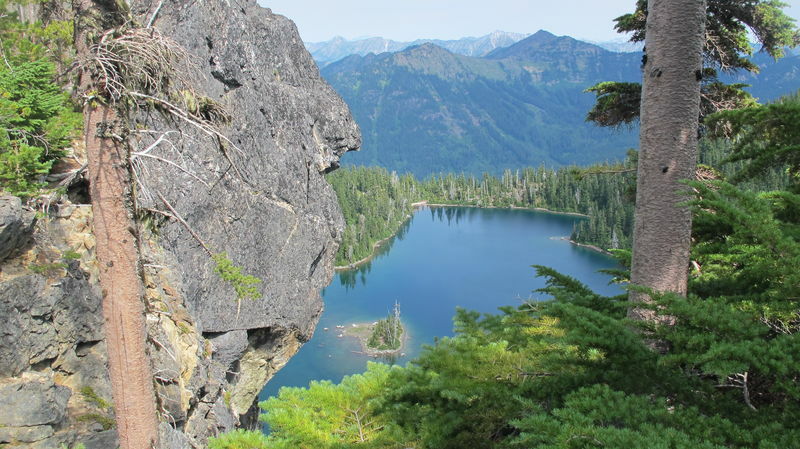 Take wonderful hikes nearby with breath-taking locations and view. Majestic Pines Lodge in the snow is a delightful winter retreat with sledding just outside the door, along side the house. Stevens pass is just 25 minutes away. The is plenty of local cross-country skiing, sand snowmobiling available within minutes. Me and my family visiting from overseas had a great time in the lodge! We had an amazing time spending Christmas with our family at your lovely home, it was a beautiful winter wonderland !!!! Had a great time staying here! Had a great time staying here! Interior of the house is very well furnished. What a great place to call home for three days!!! 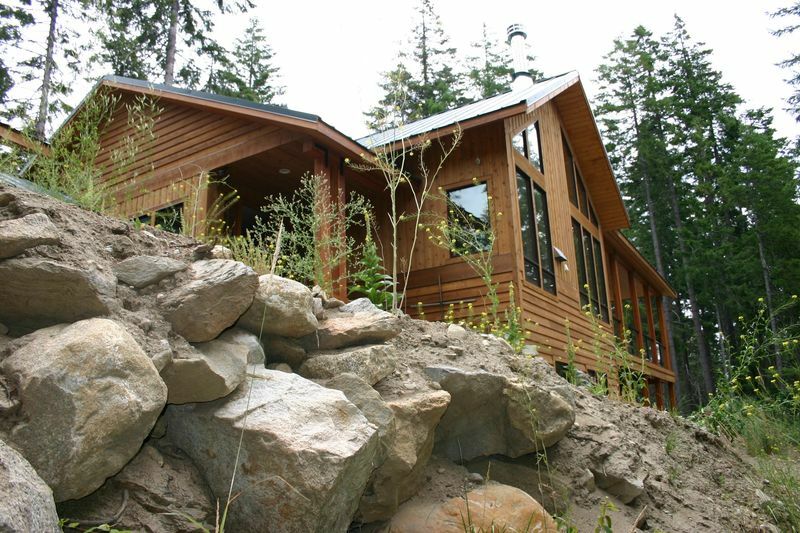 The quality of the home was matched by the beauty of the surrounding woods and nearby lake. The check in/check out experience was also organized and easy to navigate. Thank you so much... Will definitely refer family and friends to Destination Leavenworth from now on. This house was a cook's dream! Everything well stocked. I do appreciate how helpful you have been regarding every detail of our stay. You have really made this special time for our family totally stress free! Wonderful setting perfect for an unforgettable family winter vacation. We might have found a new tradition! We had a great time with our big family in this beautiful home , well decorated. We specially loved all Christmas decor all over the house. We had a great time! The house was large and plenty of space for our family. only two things i would have liked--a king sized beds in the master bedrooms and 100 per cent cotton sheets. Everything else was perfect! We loved the house. We've rented many vacation houses over the years. This is one of the best equipped and cleanest we've ever stayed at. We'd definitely stay here again. Beautiful and so clean. Perfect for our family vacation. Great location. 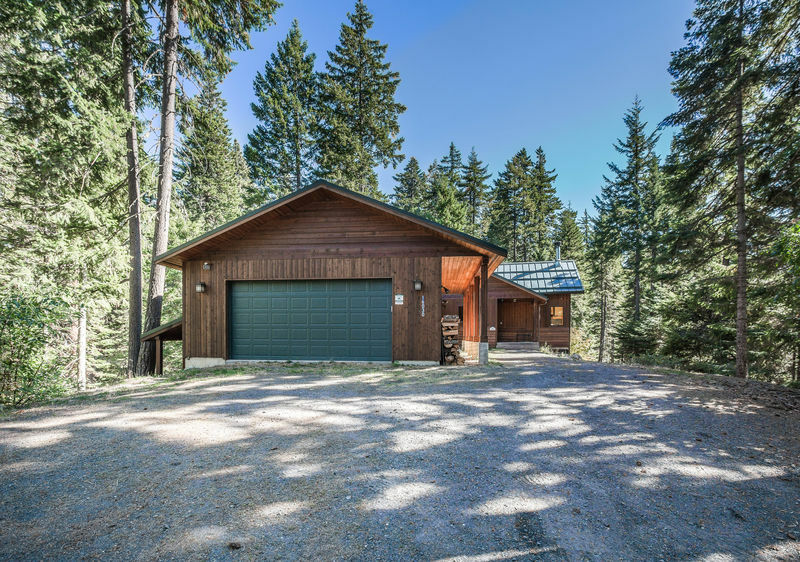 Just a short walk to the lake and only 20 minutes from Leavenworth. Loved that there was a fully stocked kitchen and a homey touch to this amazing place. This cabin was amazing and has everything that you need! The kitchen is stocked with all the cooking utinsels and items you need! We would definitely come back to this cabin!! This is a gorgeous home that is beautifully appointed. Would not change anything about it! 11 adults and a toddler shared this space for a wedding weekend. Our every need was met and we had plenty of space. The management property & app were clear and effective - easy to follow. We'd return in a heartbeat! Beautiful home! Would stay again!! Such a wonderful weekend. I loved the home - it had so much warmth and character. Very clean, organized, and beautiful. I would definitely stay here again! Our group of friends had a great time! Thank you so much! This rental property was the best place that we have ever stayed. It was perfect for our family thanksgiving get away. There were 14 of us, and the home accommodated us very well. Each adult couple had their own bedroom which worked out perfect. The kitchen was very well stocked. It even had spices and cooking oil and every possible small appliance that you could need. The setting is beautiful and I don't know how you could not relax there. The furniture was so comfortable, you can just feel yourself melting into it. Would love to return in the summer time. Beautiful setting. It was like being totally secluded nestles in the trees. The house was beautiful. It was everything it promised to be and more. 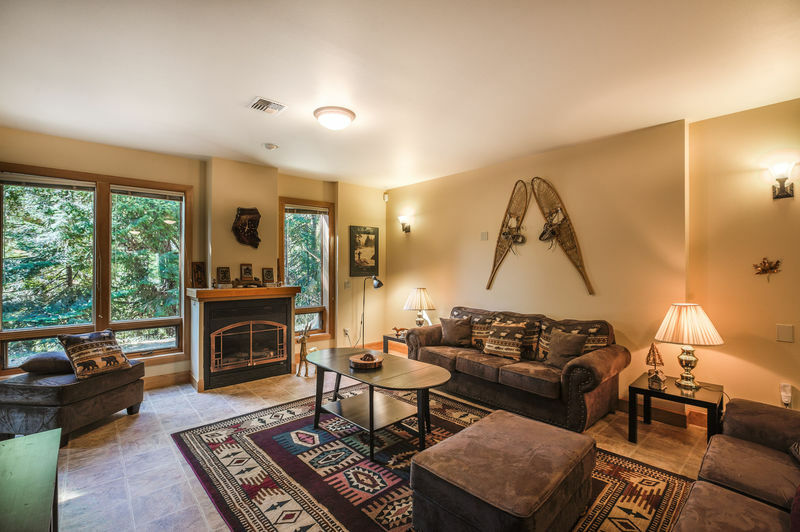 So homey, beautifully decorated, comfortably furnished and plenty of room for a large group. Bathrooms were plentiful and sleeping areas comfortable. Kitchen was a dream (except it could use a larger or 2nd refrigerator for 14 people!) The home is well maintained. Close to the Lake Wenatchee State Park and the river. Again, we are thrilled with Majestic Pines and the Destination Leavenworth crew. This home offers plenty of space, comfy bedrooms, and great proximity to all this area has to offer. we'll be back.